The 30 foot by 50 foot frame party tent is the Premier West Coast style. This frame party tent is made by Ohenry Tents and will work perfectly to keep your guest protected from the sun and rain for your next event. The tent is extremely durable and withstand numerous set up and take downs. 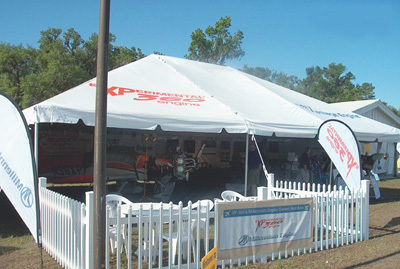 This is a popular tent for rentals and other commercial use. It even comes with a handy bag for transporting and storage. Do you sell clear sidewalls? Unfortunately, we do not offer clear side walls for this unit.